Scuba Santa may have had to return to the Great Barrier Reef, but that doesn’t mean he forgot to leave a midwinter’s gift at the Newport Aquarium. From January 7 to February 28, Newport Aquarium is running their “Winter Family Days” promotion where all day, every day, two kids get in free with each full-price adult ticket purchased. So, families of four kids, grab Mom and Dad and go. You have eight kids? Find Grandma and Grandpa. You’re the Duggars? Well, good luck, I guess. A full-price adult admission is $23 and a child’s admission is normally $15; so, what is typically a pretty expensive family affair is suddenly quite affordable. The aquarium is widely considered one of the best in the country, even getting voted top aquarium in the country in 2012 per the “10Best” Travel website. 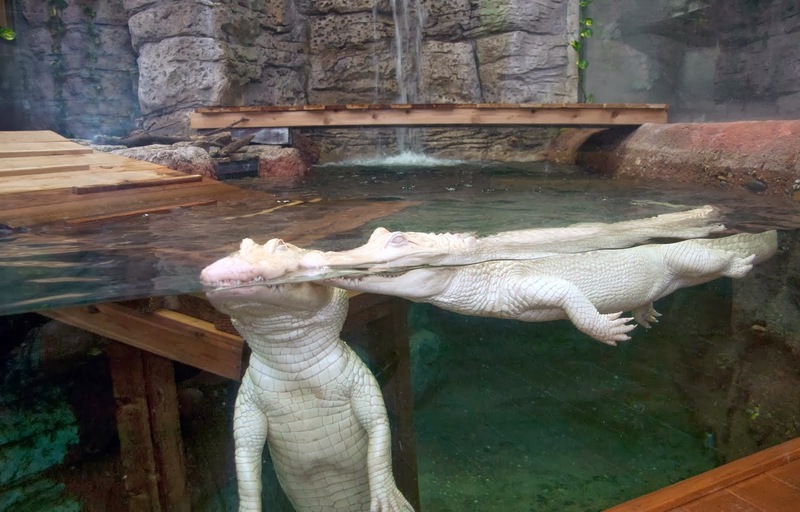 Right now, it is featuring Snowball and Snowflake, two of the fewer than 100 white American alligators remaining in the world. The alligators are leaving at the end of February so take advnatgae of the promotion. Additionally, as always, you can see the world’s largest collection of shark rays and even have the opportunity to pet a shark in the shark tank. This was NOT Knox’s favorite, as he likes to say (he likes to get close but won’t quite touch the animals). Finley, on the other hand, fearlessly touched the shark several times. For more information on the aquarium, visit their website. Otherwise, pack up the family and go today!